Mr. Berger has been a trial lawyer in Miami for over twenty years, having tried personal injury, medical malpractice, P.I.P., and wrongful death cases in Courts throughout Florida. 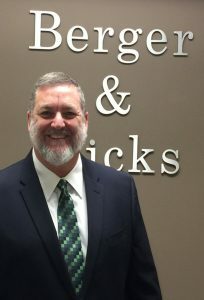 With Berger Hicks, he heads the personal injury litigation department, protecting the rights of those injured from the adverse interests of the insurance industry. He knows that the only way to fight off insurance company abuse is to be aggressive in litigation and to ensure that his clients get their day in court. Through his efforts, he has obtained combined verdicts in the millions of dollars for his clients. Personally. Mr. Berger grew up in the Pinecrest area and is a graduate of Miami Palmetto Senior High School. He resides in Pinecrest, Florida, with his wife, Karen, and four children.